Item#:3943-1020 -This high quality stapler style slot punch makes adding a slot to your ID badge, name tags or key cards easier than ever. 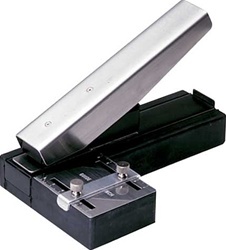 You can use this slot punch as a hand held unit or place it on a desktop for larger punching jobs. This punch can handle laminated documents, card stock and PVC ID cards up to 33mil thick. It even has a receptacle to collect the punched slots so that you can reduce the mess in your workplace. This particular punch has a centering guide to help you make sure that your slots are aligned correctly on your badge or ID. The centering guide is adjustable and can be locked into place for larger punching jobs.